For anyone who has been a victim of fraudulent credit charges, you know what a hassle it can be to get those charges removed (assuming you even noticed them in the first place). Even though we are protected by federal law for any charge fraud beyond the first $50, there may be various forms to fill out with the card issuer, and then you may need to get a new credit card number, which means redoing the information with any sites or vendors who have your credit card information on file. Now there is a new breed of credit cards coming soon from MasterCard and Dynamics (in partnership with Visa) that use electronic chips to make your card more secure, even if they fall into the wrong hands, and offer more convenient rewards options. In Singapore, Mastercard recently unveiled a new interactive payment card that looks almost like a regular credit or debit card except it has a small LCD display and tiny touch-sensitive buttons. In the future the card could display “credit balance, loyalty or reward points, recent transactions, and other interactive information,” said the company, in a statement (PDF). The real value, however, is that it provides extra security for “card-not-present transactions” when people buy things online or over the telephone. That’s because the card generates unique one-time passwords that you use to give your bank confidence that it’s really you making a purchase. 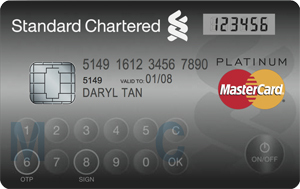 It goes live in January 2013 for all Standard Chartered Online Banking or Breeze Mobile Banking users “for higher-risk transactions such as payments or transfers above a certain amount, adding third party payees, or changing personal details,” Mastercard says. Dynamics makes several types of programmable credit cards that can do everything from increasing security to customizing your rewards options thanks to a programmable magnetic stripe that can be rewritten with each transaction. The cards work with payment readers already in stores and are the same width as a regular credit card but squeeze more than 70 electrical components into them. They also include a battery that will last for three years. The company makes several different kinds of cards. One asks you to enter a code onto it and if you input the correct one, it will display the credit card number and write account data to the stripe for a certain amount of time. When the time's up, the number and data are erased so if someone else gets a hold of your card they can’t use it. Some Dynamics cards also generate one-time passcodes. Another is a smart card and payment system called ePlate that gives you rewards from third parties who make a small profit when you buy things. These third parties–a menagerie of people, groups and causes including best-selling authors, games, charitable causes and more—track your purchases through “experience apps” that you install on the card via your smartphone, tablet or computer. You can pick two apps, each of which is linked to one of two buttons on the card. Before making a purchase you touch whichever button you want to associate with your purchase. For instance, with one button you might associate your purchases with the shopping game Black Friday. For every two dollars you spend using the card you earn one game credit. Game credits can then be used on things like game powerups or more energy inside the game. The annual percentage rate for ePlate ranges from 14% to 18%, depending on your credit score, and there’s an annual fee of $99. 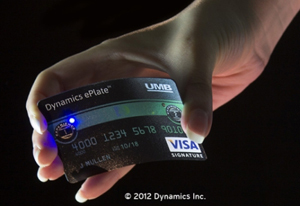 Check out the full lineup of Dynamics’ high tech payment cards. And here’s video of Dynamics CEO Jeff Mullen explaining how some of them work. The smart phone of credit cards. If it fell into the wrong hands could be manipulated.